You probably know that CoQ10 plays a pivotal role in your health. CoQ10 is the "spark plug" that ignites energy production in every one of your 50 trillion cells. CoQ10 is also one of the most powerful antioxidants in your body. Without CoQ10 … no energy … and no life! But until now, this conventional ubiquinone (CoQ10) was your best (and only) option. Another problem is that once the CoQ10 enters your body, it has to be converted to a more natural form of CoQ10 called Ubiquinol in the cells of a healthy young person- before you get any of its energy-boosting benefits. As you age your ability to naturally convert to Ubiquinol is less and less. Some reports say this decline becomes apparent around 40 years of age, some much earlier. This is why over 20% of Americans report having fatigue intense enough to interfere with normal activities. There is no known cure for chronic fatigue syndrome (CFS). Medical treatment is typically aimed at relieving symptoms. Ubiquinol, the active antioxidant form of CoQ10, is essential to the body’s natural production of cellular energy and provides powerful antioxidant protection to cells. Without it, the body cannot sustain energy. The body’s ability to naturally produce this vital nutrient is diminished over time. In addition, Ubiquinol is one of the most important antioxidant for help prevent oxidative stress. Only the Ubiquinol form has the antioxidant capability of protecting the cells from damage due to free radicals. As we age, the levels of antioxidants in our bodies fall. Due to the natural course of aging and the increasing reach of environmental toxins, it may be difficult to get the optimal amount of antioxidants through food alone; dietary supplements may be of benefit to optimize and maintain a health cellular balance. Medications can lower your CoQ10 levels, too. Cholesterol-lowering statin drugs do the same. In fact, statins can reduce blood levels of CoQ10 by up to 40%. The buildup of plaque on the arteries is the number one cause of cardiovascular diseases. When physicians prescribe these cholesterol-lowering drugs, they may impair normal liver function and carry the risk of muscle damage. THE HEART IS THE MOST ENERGY DEMANDING ORGAN IN THE BODY. The American Heart Association estimates that cardiovascular disease is responsible for more than 30% of all the deaths in the United States. Although men generally have cardiovascular diseases at higher rates than women, that changes after women reach menopause; CVD is the leading specific cause of death for postmenopausal women, accounting for more deaths than all other causes combined. KanekaQH™ is ubiquinol, the reduced, active antioxidant form of Coenzyme Q10. Introduced in 2006, KanekaQH™ is the first supplemental form of bio-identical ubiquinol ever developed and is manufactured exclusively by Kaneka Corporation. It is derived from KanekaQ10™, the world’s most recognized and researched CoQ10. Because ubiquinol is one of the strongest lipid-soluble antioxidant available, KanekaQH™ provides defense against oxidative damage to the body’s cells, including lipids, proteins and DNA*. It also plays an essential role in cellular ATP (energy) production*. Supplementing with KanekaQH™ is ideal for those with reduced ability to convert CoQ10 into ubiquinol since it is reduced and ready for use in the body’s cellular energy production process*. bozoomer Ubiquinol KanekaQH™ is more absorbable than CoQ10, which means that optimal levels of CoQ10 can be restored quickly and efficiently, especially in those who are over 40 years of age or are affected by certain age-related conditions. Studies have shown that 300 mg of Ubiquinol in a softgel can produce the same plasma level increases as 2,400 mg of ubiquinone (CoQ10) in a chewable tablet. 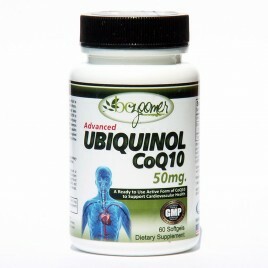 Ubiquinol will restore healthy levels of CoQ10 in your bloodstream and organs faster than anything you experienced before. The recommended dose of Ubiquinol varies based on each individual’s needs and the specific condition being treated. However, those who are older or suspect they have decreased CoQ10 due to disease may want to start supplementing with 200-300 mg of bozoomer ubiquinol KanekaQH per day. Studies show that the plasma levels plateau at about two weeks at this dose. Then, 100 mg per day is a good maintenance dose. It always best to consult your personal physician when discussing proper dosage.